CHEAPEST: Only 12.99usd, you will get one camping lantern & one mini flashlight. Perfect survival kits for hiking, camping, fishing etc. 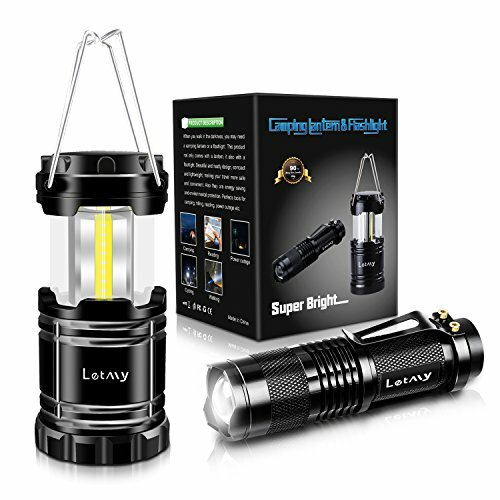 LED LANTERN: 350 lumen; 100000 hours\' life span; COB LED chip ; Water resistant; 360° illumination, cover ups to 400 squares lantern flashlight. More important, with magnetic base, you can stick it on any iron. 100% SATISFACTION: Every genuine LETMY comes with a 90-day return refund guarantee & 2-year replacement warranty and lifetime supported by LETMY, a U.S.-based company. Great to have in your emergency kit.